The Djabugay or Tjapukai people are an Australian Aboriginal rainforest tribe from the wet tropics of northern Australia. The Djabugay people have names from the Djabugay language and transmit their tribal cultures from generation to generation. The Djabugay language was spoken in the Cairns, Port Douglas, Mareeba, Kuranda and Atherton areas, with regional dialects between local Bama ( people). 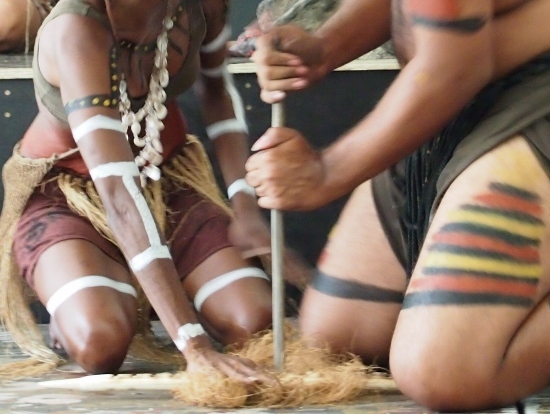 The Djabugay were the people of the coastal rainforest of Far North Queensland. Learning about Aboriginal culture and history is firmly on the official Australian curriculum. Even if it wasn’t, I’d want children to learn as much as possible about the original inhabitants of Australia. They are a remarkable people and their culture deserves our respect and understanding. Sadly, this doesn’t always and hasn’t always, happened. European settlers pillaged Djabugay hunting and gathering lands for gold and tin before building a railway line over a traditional walking route. The Djabugay fought back until John Atherton called in troops to massacre the Djabugay in the infamous 1890 Speewah Massacre. After this atrocity, the people were forced to live in the Mona-Mona Mission, some working on local coffee plantations. It wasn’t until 2004 that the Djabugay were recognised as native owners of the Barron Gorge National Park . I’m all about raising global citizens, future adults who respect all peoples of the world, it’s something I’m passionate about. 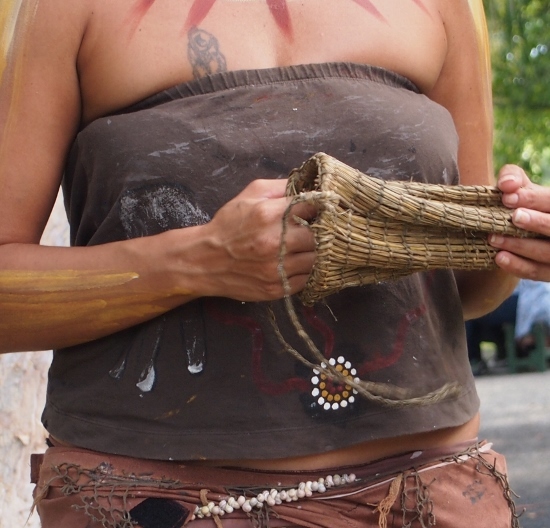 Respect comes with knowledge, so we try to experience as much Aboriginal culture as we can, any way we can. 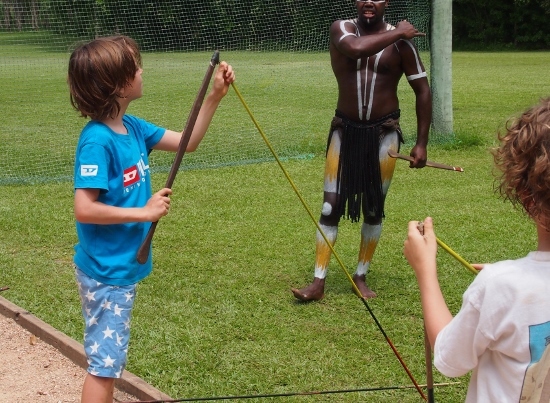 Part of our learning about our local Rainforest Tribes was a visit to Tjapukai, an award winning Aboriginal Cultural Park just outside Cairns in Far North Queensland. The park is set in rainforest, on traditional Tjapukai land and celebrates the culture and traditions of the people of the rainforest. READ NEXT BLOG Cairns Lagoon. The Esplanade. Cairns Homeschool Group Outing. Aboriginal bush foods and medicines. We explored the park, watched dancing, song and fire lighting and listened to talks on bush foods, medicines, weapons, hunting, tribal discipline and wars. We learnt a few words in the Tjapukai language and watched a presentation on didgeridoo making and playing. 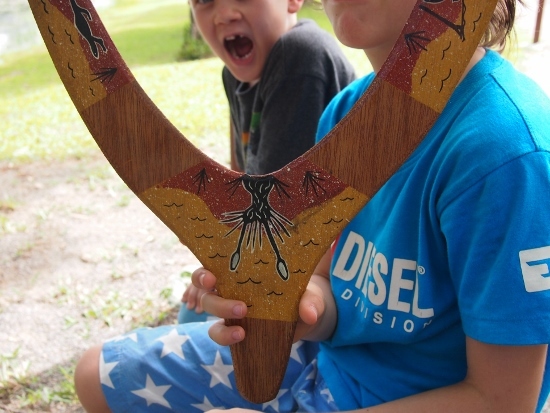 The highlight for the children was spear and boomerang throwing along with a spot of Aboriginal art and face painting. I can’t remember everything and I’m sure the children remember even less, but over years of repeat exposure most of this will sink in to young minds. It was a great opportunity for the kids to interact with Aboriginal people, something that rarely happens in our normal lives as our communities tend to be segregated. I think that is what impressed me most about the park. 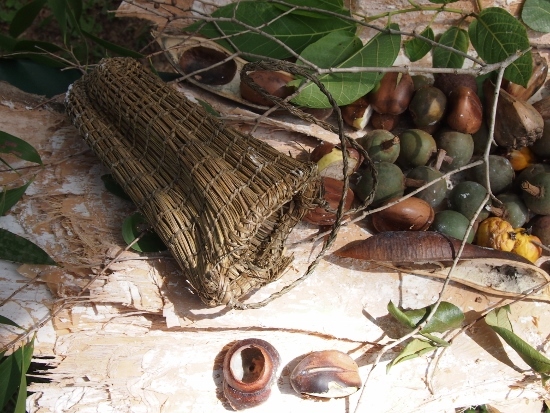 A dilly bag for gathering Aboriginal rainforest foods, amongst other purposes. 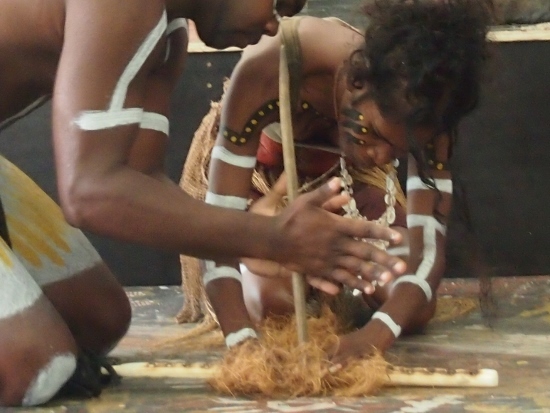 The Tjapukai people and all indiginous Australian peoples ( there were over 400 tribes) are masters of bush food. 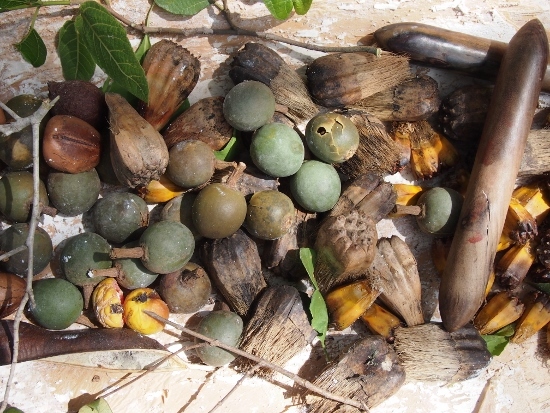 The selection of nuts, fruits and seeds was rather beautiful, don’t you think? There was no witchetty grub or bogong moth eating here, instead, we learned how to wash seeds in dilly bags ( woven from pandanus leaves) for days, to remove the toxins before they could be eaten. Sucking the abdomens of green ants is popular in Far North Queensland, not just among the Aboriginals, my children like to eat them too, they are sweet and lemony. 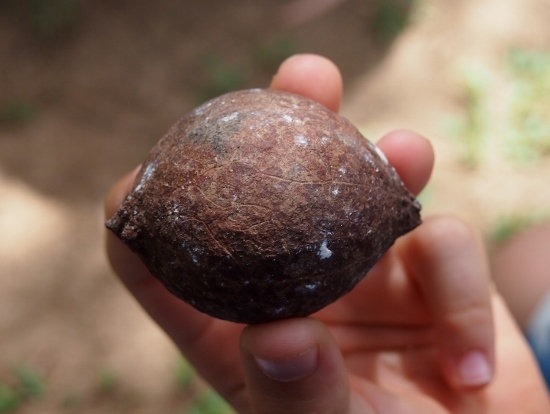 A crushed green ant colony makes a medicinal tea, good for colds and sore throats. 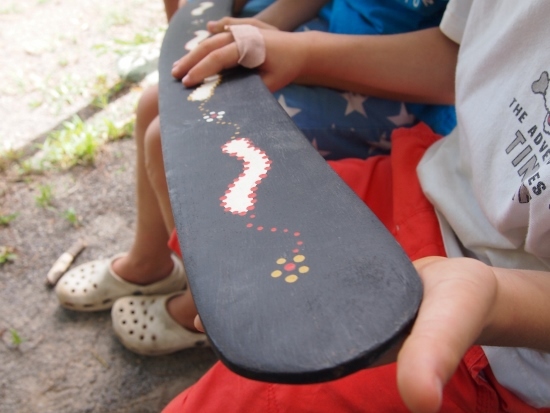 Boomerangs come in all shapes and sizes, cut from parts of the tree that naturally lend themselves to that shape. They were used to knock birds down from flocks. 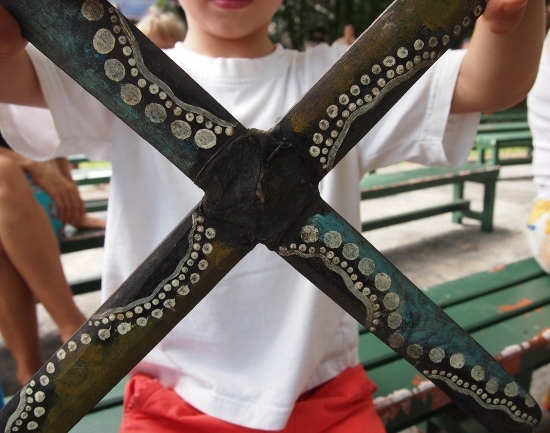 Aboriginal peoples also used large wooden swords, vicious looking things, shown below. They would be used in tribal punishments to break collarbones and kneecaps of tribal law breakers. Disciplin like that and respect for elders held Aboriginal tribes together before traditional practices were banned under the tragic Queensland Aborigenes Act of 1971. Spears were also used in discipline, a repeat offender would have a spear driven through his thigh. If he failed to pull the spear all the way through he brought great shame on his forefathers. All of these wooden tools were traditionally shaped using rocks, flints, or in coastal tribes, shells. Shields carved from solid lumps of wood were used in battles. I had no idea that Aboriginal tribes used to fight each other, I suppose I’d never thought about it. One of the shields in the small museum still showed blood stains. 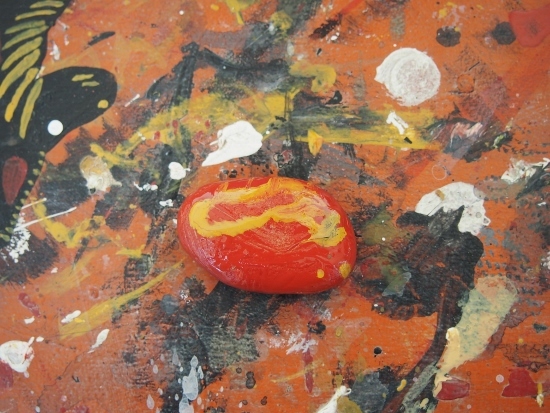 Weapons and war craft were certainly the highlights for my boys, but they did enjoy the facepaintng and trying out Aboriginal style painting on small stones. My eight year old was mesmerised by the music and dance. There wasn’t much of a focus on Aboriginal art at the park, for that you would have to go elsewhere. 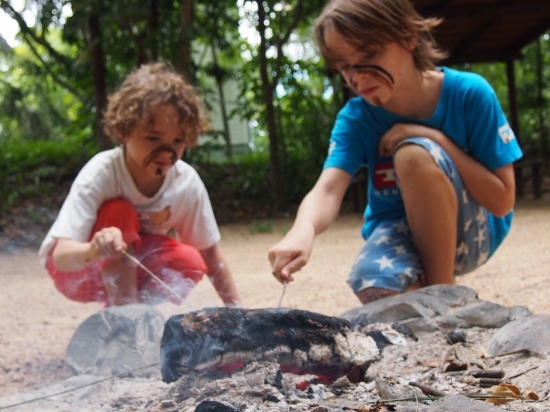 There are plenty of places to learn about aboriginal culture and history in The Far North. I highly recommend the Laura Aboriginal Dance Festival, held every other year in June, we hope to go this year, our second visit. You can see real Aboriginal rock paintings for yourself just outside Laura. 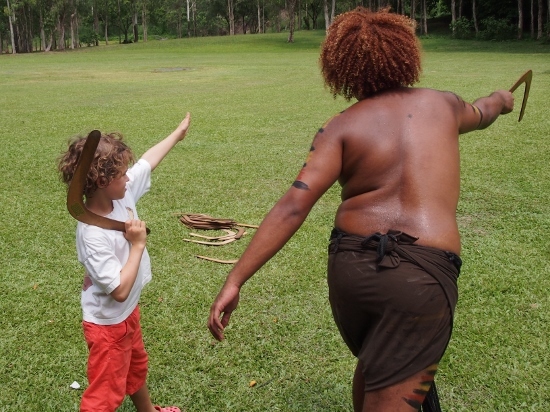 The Kuku Yalangi people of the Mossman Gorge give guided rainforest walks on their traditional land, we haven’t tried that one yet, it’s on the to do list. 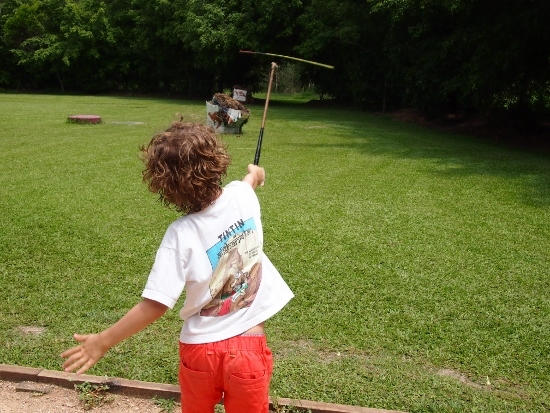 What a fantastic outing and experience for kids and adults alike! What an awesome experience! I would love for you to link up activities like this that teach children about other languages and cultures at my weekly link-up “Say it Two Ways Thursdays”. Thanks Leanna, that’s great. We are pretty lucky to be sharing this part of the world with our indigenous people, even if they have been so appallingly treated. Wow this is wonderful! We learned a TEENSY bit about Aboriginal culture this week so reading your lovely detailed post & seeing your photos was a treat! We’re in England and currently studying the Middle Ages – I definitely wanted my children to learn about the Aboriginal people so we have some proper context before we later come on to learn about colonisation. Thanks Lulu, that’s great. We are going to the Mossman Gorge soon for the guided walk with the Kuku Yalangi tribe, stick around for that one. I wish I could post the photos from the Laura Aboriginal Dance festival, that was fantastic. But for today, I have to write the Homeschool Report, far too boring! That’s excellent, thanks Leanna, I’ll share Culture Swapper with everyone. I’d better get out there and do something interesting, I have an Aboriginal Guided walk with the Kuku Yalangi tribe at Mossman Gorge lined up, if it stops raining!